I'm using SCCM 1702, which is the latest version of SCCM available. I have installed it on a brand new Server 2016 box just this week. I have deployed clients and done some test software deployments without problems. All the installed roles are working properly. Everything is good except the auto deployment rule I set up for AV definitions. I have of course Googled this problem, and every single link that comes up says that the permissions are wrong on the \UpdateServicesPackages directory. However, I have been over both the share and NTFS permissions on that directory and they are fine. Lastly, I have configured an account svc-SCCM as the credentials to be used when connecting to the WSUS server (from the Admin node -> Site System Roles -> Software Update Point). That account is a domain admin, and I have verified I can connect to that share using it from a remote PC. Clearly there is not a permissions problem. 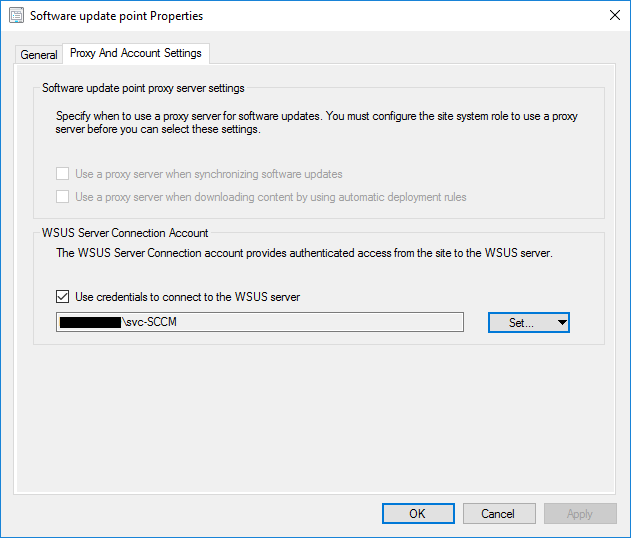 I can also connect to the WSUS console remotely using that svc-SCCM account, and the WSUS server itself is not reporting any problems in the event logs. Clients are checking into it and reporting status just fine. I'm also not having sync issues either. SCCM is syncing the update catalog fine, and I can see 1000+ updates in the All Software Updates node. And yes, I have confirmed that this is the correct path for the deployment package. Browse other questions tagged windows sccm or ask your own question.